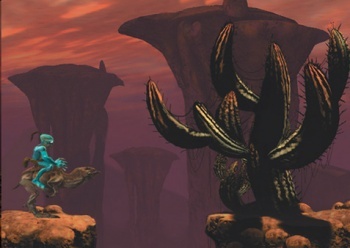 Lorne Lanning and Just Add Water are bringing back the original Oddworld game in HD. When Just Add Water disclosed that it was working on an HD PlayStation Network remake of the Xbox's Oddworld: Stranger's Wrath, the studio also hinted that more Oddworld projects were in the works. Oddworld universe co-creator Lorne Lanning recently told EGM that the next of those projects will be an HD remake of Oddworld: Abe's Oddysee. Abe's Oddysee was the very first Oddworld game ever released, making its way to the PlayStation in 1997. It focuses on a Mudokon slave named Abe that must make his way through various puzzles and sticky situations to free himself and his Mudokon friends from captivity. Sometimes, he farts. Abe's Oddysee was well-received for its offbeat world, gameplay elements, and visual style. Lanning refers to the Abe's Oddysee remake as Abe HD. "It's basically Abe's Oddysee being redone in a 3D physics engine as a 2D side-scrolling platformer," he says. Lanning and Just Add Water want to retain the original Oddysee experience using new technology. Now that both Stranger's Wrath and Abe's Oddysee are being remade in HD, I think it's a safe bet to expect Abe's Exoddus, Oddysee's sequel, to go under the knife next. Even though Oddworld is a land filled with methane and violent, alien-like creatures, there's something comforting about its revival. Lanning didn't reveal when or where Abe HD might first appear.